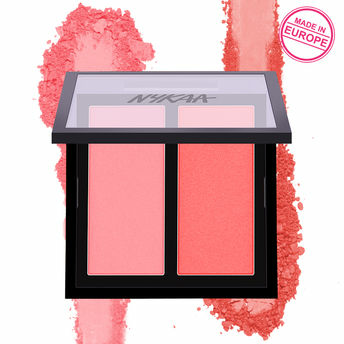 It's time to play naughty and nice with Nykaa Get Cheeky Blush Duo. This blush duo brings a natural-looking flush of color that pops on every skin tone. This palette provides a dominant color and a subtle color for blending and softening edges. Infused with radiance-boosting minerals, These pigments sweep on weightless, And a soft veil of color. The ultra-light, Micronized pigments of these shades blend effortlessly into the skin and give you a buildable coverage to enhance the apples of your cheeks! Explore the entire range of Blush available on Nykaa. Shop more Nykaa Cosmetics products here.You can browse through the complete world of Nykaa Cosmetics Blush .Alternatively, you can also find many more products from the Nykaa Get Cheeky! Blush Duo range.